Three substances complement and enhance one another excellently perfectly, thereby creating the required conditions for a successful and long-lasting rejuvenation process. Not only is the cuckoo flower well-known as a medical plant, but also acts as one of the most stable and oxidation-resistant lipids (water-insoluble natural substances) in cosmetic products. This means, above all else, that the stability of the oils contained in the crème is further increased. Furthermore, the high vitamin C content strengthens the body`s defences and provides a soothing effect on the skin. The premium-quality raw material ImmucellTM also contained in the crème is the natural alternative to thymus peptides. The support it provides for oxygen exchange between the skin cells stimulates the skin`s metabolism and immune system. The skin becomes fresher, rejuvenated and smooth. Visible effects become apparent within a short space of time. SEPILIFTTM DPHP as a further essential ingredient also has a three-fold effect on the skin. It supports the rejuvenation process, supplies the skin with important moisture and finally prevents skin wrinkles from ageing. 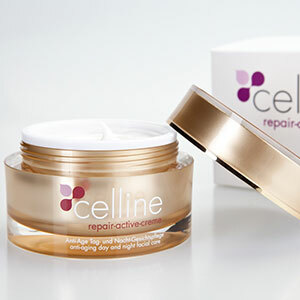 Celline Anti-Age Repair Crème supplies demanding skin with vital substances for long-lasting regeneration through relaxation, regeneration and resistance. The premium-quality raw material ImmucellTM contained in the ampoules support the oxygen exchange between the skin cells, stimulates the skin`s metabolism, and revitalizes the skin`s immune system. We are thereby creating the required conditions for a successful and long-lasting rejuvenation process. Wrinkle Reduction by more volume. Hyaluronic acid is a body own component in the connective tissue of the skin. This active concentrate supplies the skin with important moisture, smoothens the skin, and improves the elasticity of the skin. Age-related decrease in the body`s hyaluronic acid production should be compensated by a supply of extra Hyaluronic acid from the outside. 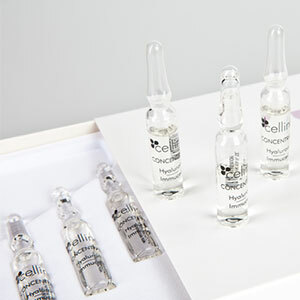 The incorporated antioxidant substances in the ampoules protect your skin against premature aging. The skin becomes smoother, firmer and more vital. Fine lines and wrinkles disappear – aged skin looks younger with significantly reduced wrinkles. 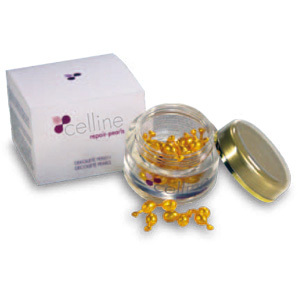 These Exquisite Beauty Pearls with their highly concentrated active agents are the ideal addition to your daily care regimen. Rich in cell protection vitamins A+E and valuable evening primrose oil, it furthers skin regeneration, while stimulating microcirculation, providing oxygen, and restoring energy to tired skin cells. In addition, the pearls moisturize, firm up connective tissue and smooth the skin. They also protect from cell-damaging free radicals, which are created through the influence of UV rays. The skin is well provided for and protected against premature aging and radiates freshness and vitality. The eye area is our most delicate facial zone, the first to show signs of aging. 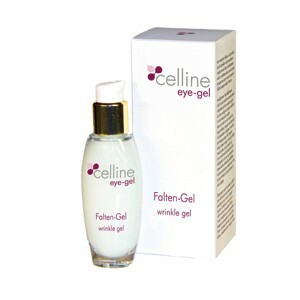 This refreshingly light, but rich eye wrinkle gel offers ideal protection from the traces of premature aging: Active moisturizers and mild nourishing agents (among them Sericin, Jojoba Oil, Soy Protein) give instant freshness and reduce lines caused by sun damage and facial expressions. Panthenol soothes and prevents irritations. The gentle texture is absorb quickly – without oily residue – and does not irritate the eyes. The gel is the ideal gentle care for even the most sensitive eyes, and also serves as a great makeup base. 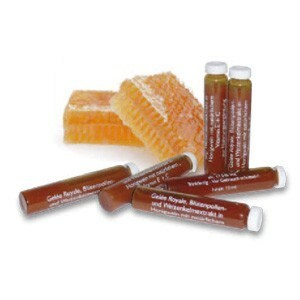 Royal jelly in mead with extracts of flower pollen and wheat germ! special needs for natural nutrients due to, for example, one-sided or unhealthy food habits or weight-losing diets; for youthful freshness, wellness and vitality. 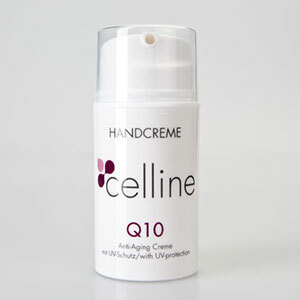 Celline Anti-Age Hand Creme is a moisturizing, smooth creme emulsion which gives your skin a silky soft feeling. The body's own anti-aging substance coenzyme Q 10 protects against visible wrinkles, while other fine ingredients like pro-vitamin E nourish the skin. Furthermore, an UV filter protects against free radicals and prevents age spots.